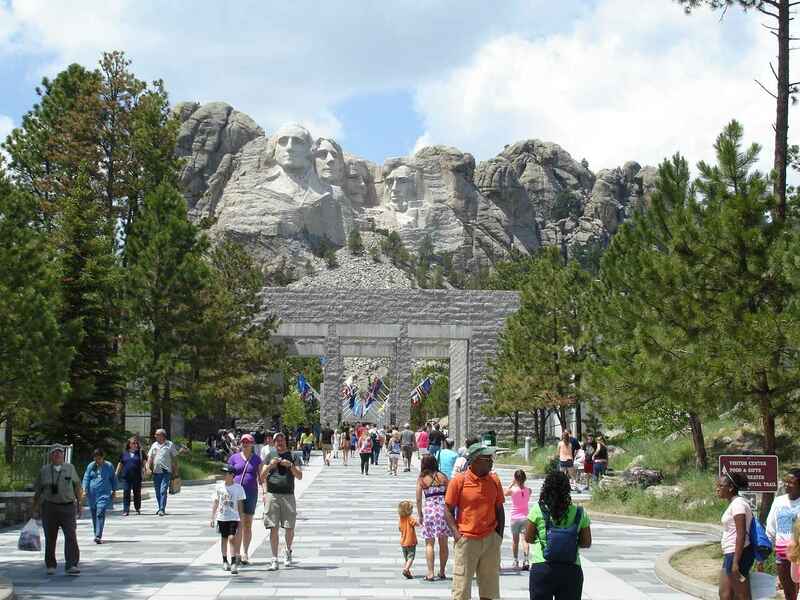 Our preference on a quieter day would be the Black Hills National Forest. We took a look at Sheridan South and would definitely try that another time. 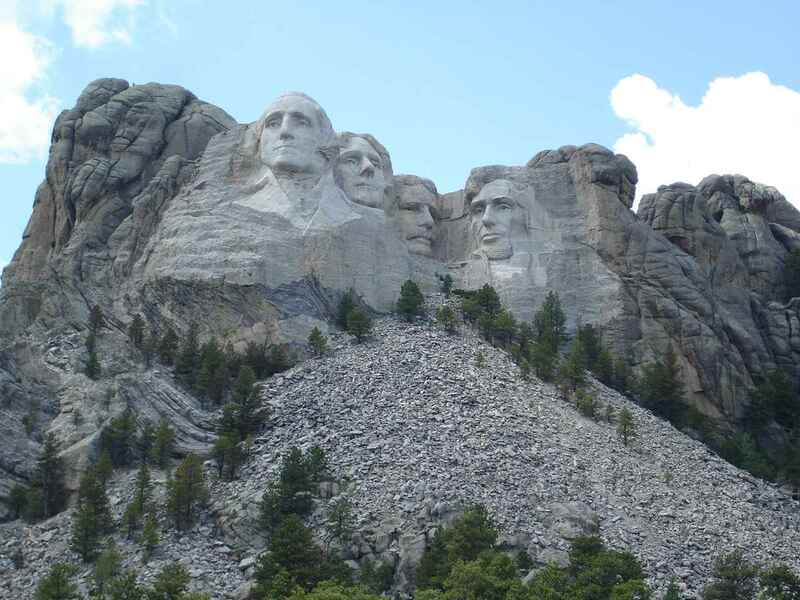 After a stop for groceries in Rapid City and finally having a good experience for an oil change at Rapid Lube, we headed for Mt .Rushmore. After hearing so much in our lifetimes about Mt. Rushmore, we were ready to be underwhelmed. But quite the opposite. We really enjoyed our visit. The shear enormity of carving sculpture out of a mountain hits you when you see the real life size of the mountain. To see the mountain before and then after is amazing. The visitors center helps to detail some of the process over the years from 1927 to 1941. Very interesting photos and equipment for the dynamiting(precision), the smoothing after drilling, the air compressors, and the lifts for equipment were on view. Just seeing the pictures of the wooden walkway the workers had to climb each day to the top and then down and the end of the day--exhausting! Add to that the pictures of work in the extreme cold of winter. The closer we got on the trail, the more appreciation for the scale and the precision of Gutzon Borglum, the sculptor. From below, you get a sense of how much rock was blasted or drilled. Much rock had to be blasted away just to get to solid granite that could be sculpted. 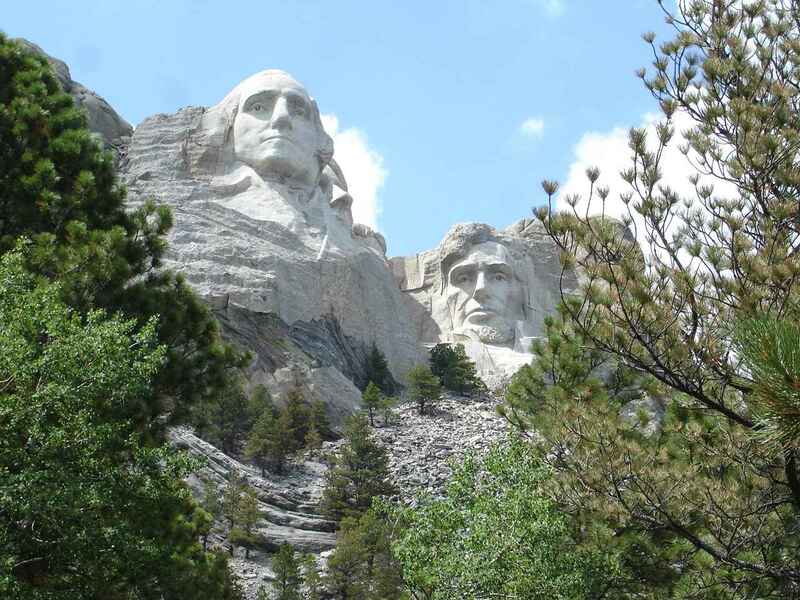 Add to that appreciation for Borglum's creativity and flexibility when Jefferson did not fit to the left of Washington due to weakness in the granite. No way to tell that from the final result. 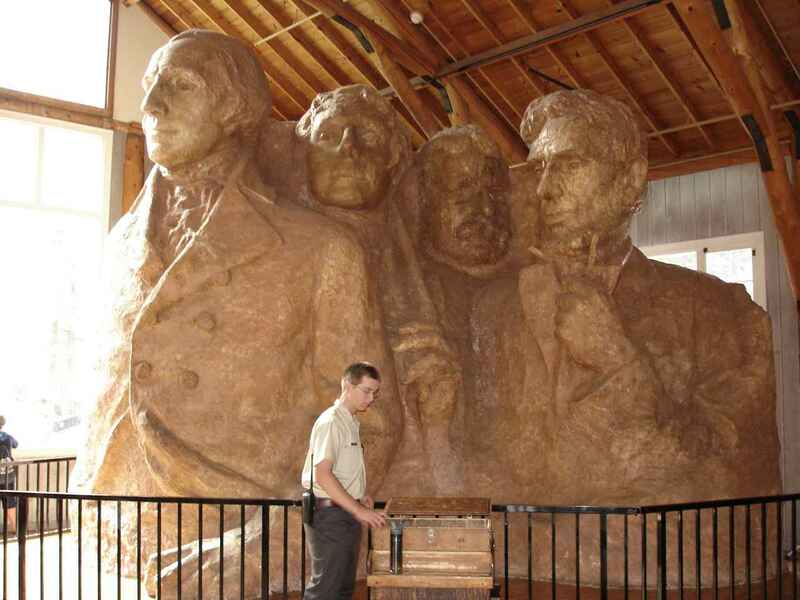 Borglum died before the completion of the entire sculpture, though he did see most of it. He originally was working on models like this, head to waist. 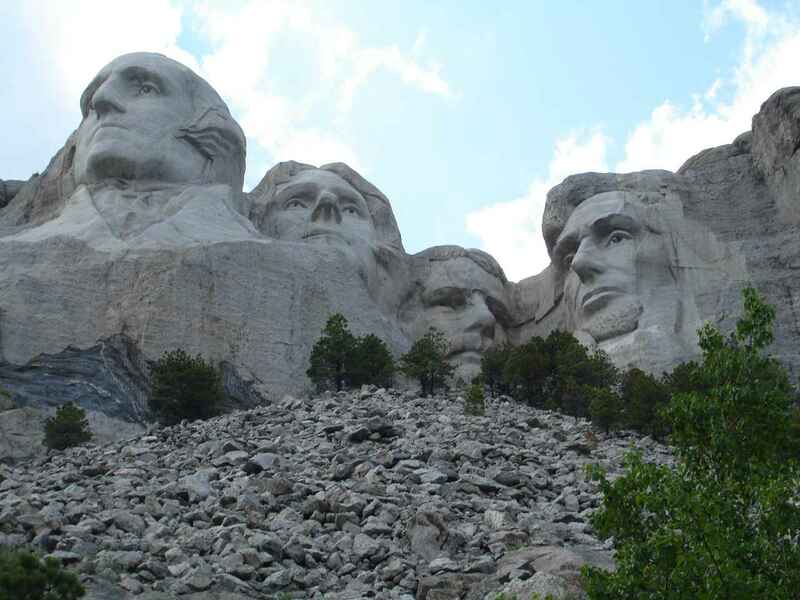 But after his death, his son , who had been working on the project, completed the sculptures as head shots. Many interesting displays at Rushmore. 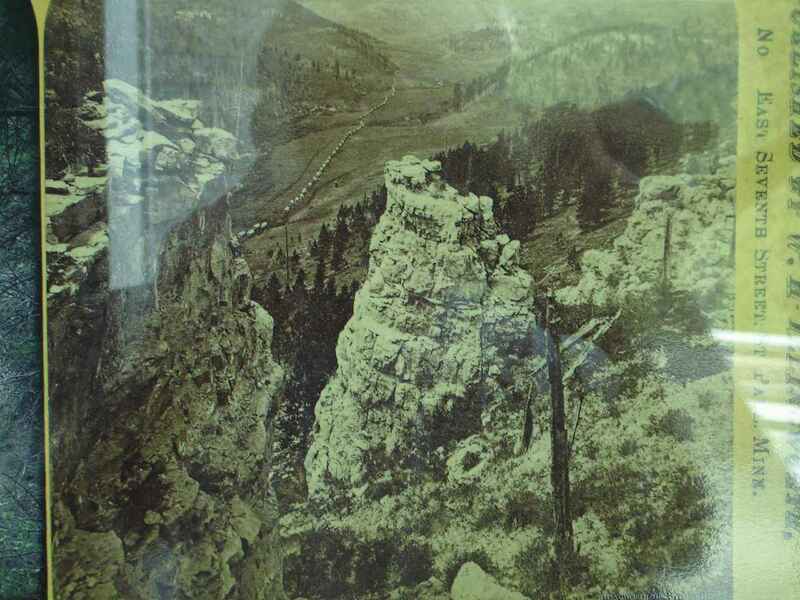 This picture, may be a little hard to see with glass reflection, was the first noted color picture of the Black Hills. 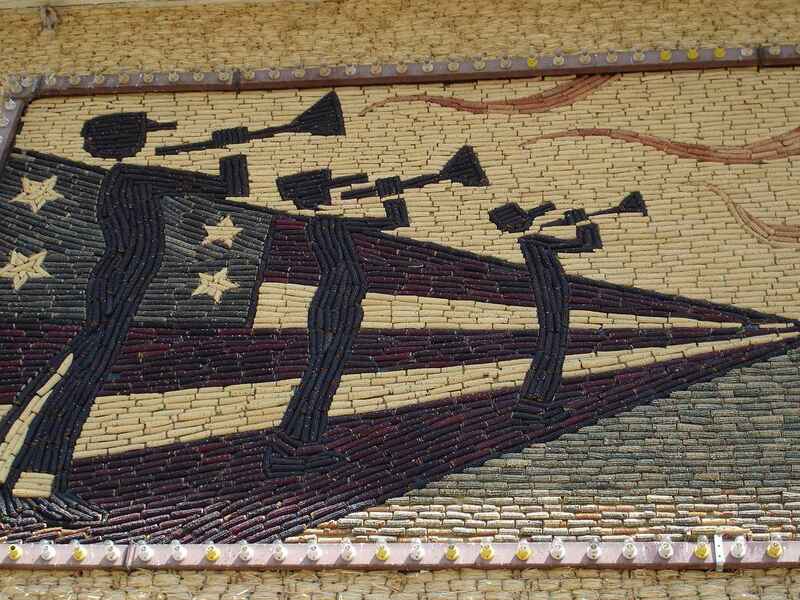 It is of Gen Custer's 7th Cavalry. 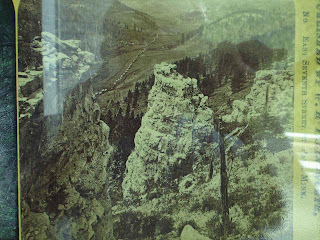 If you enlarge the picture you can see that small line of the 100 wagons moving through the Castle Creek Valley in 1874. The disastrous Little Bighorn was in 1876. 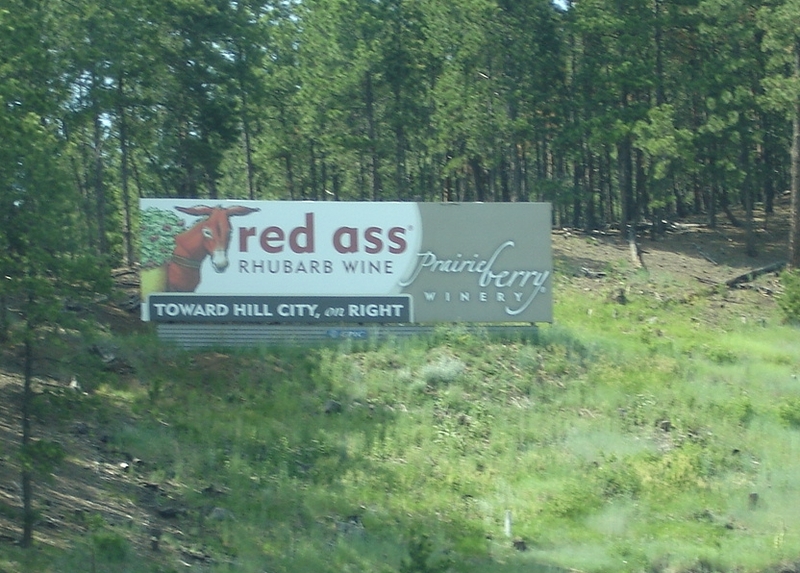 There are some interesting billboards in South Dakota. This creative? name for a wine does get your attention. 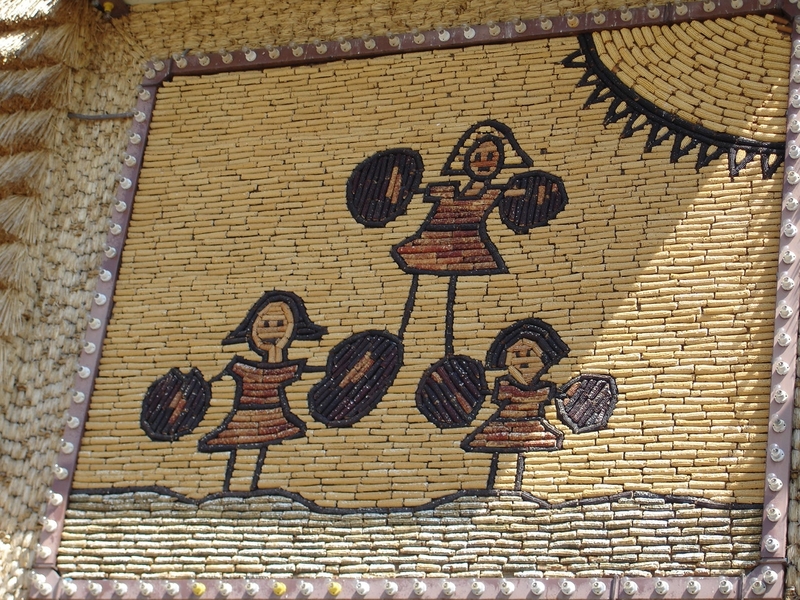 Coming through eastern South Dakota, we are struck by the large, very green expanse of corn fields. As far as the eye can see. Sometimes that is all you see--no houses, ranches, people. Maybe because we were used to the desert look of Arizona, New Mexico, and Utah, we really enjoyed all the green fields of South Dakota. And the corn in many fields was higher than "knee high" on the 4th of July. 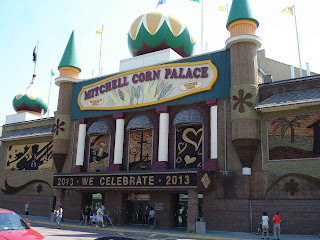 The picture above is of the famous Corn Palace in Mitchell , South Dakota. I had read about this building in RV magazines and had forgotten about it. But when we saw a billboard for it we couldn't resist. 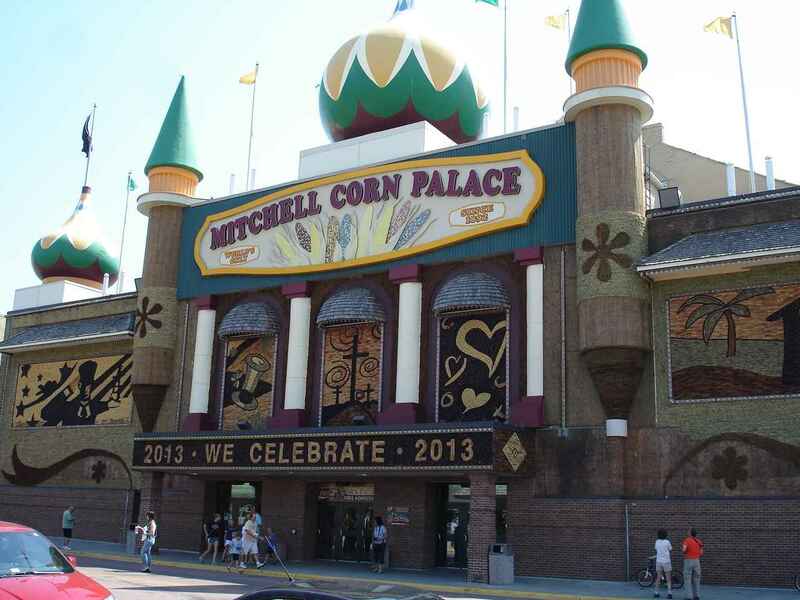 The palace goes back to 1892 when the city of Mitchell was only 12 years old. The idea was to get visitors and farmers to understand that Mitchell had a healthy agricultural climate. 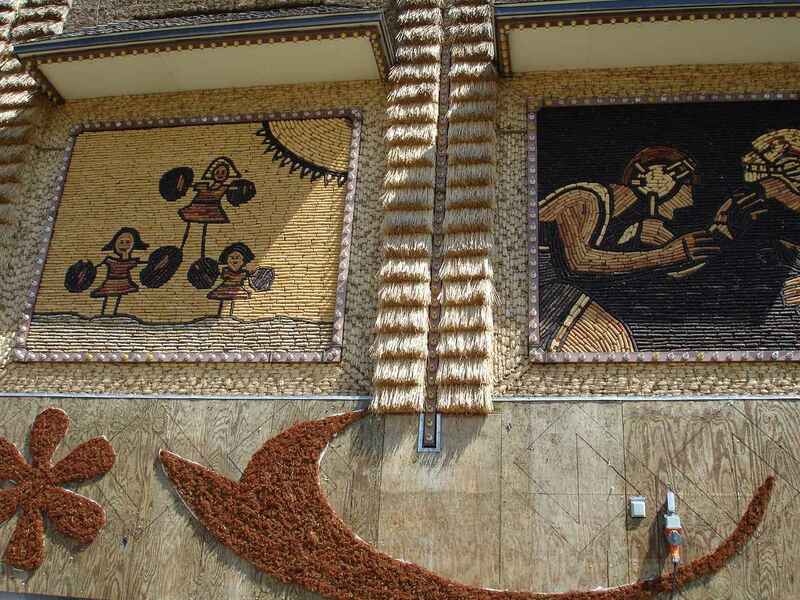 The above picture looks normal from a distance, but if you look closely you can see that the murals and decorations are all made from corn or grasses. 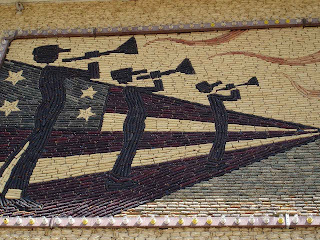 This is a little closer view of another mural on the side wall. 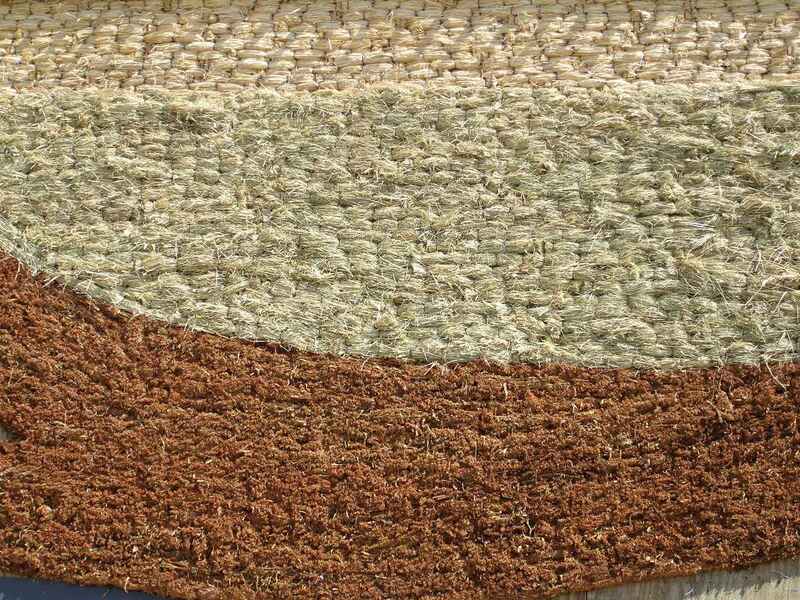 You can see varied colors of corn cobs used to create the picture. 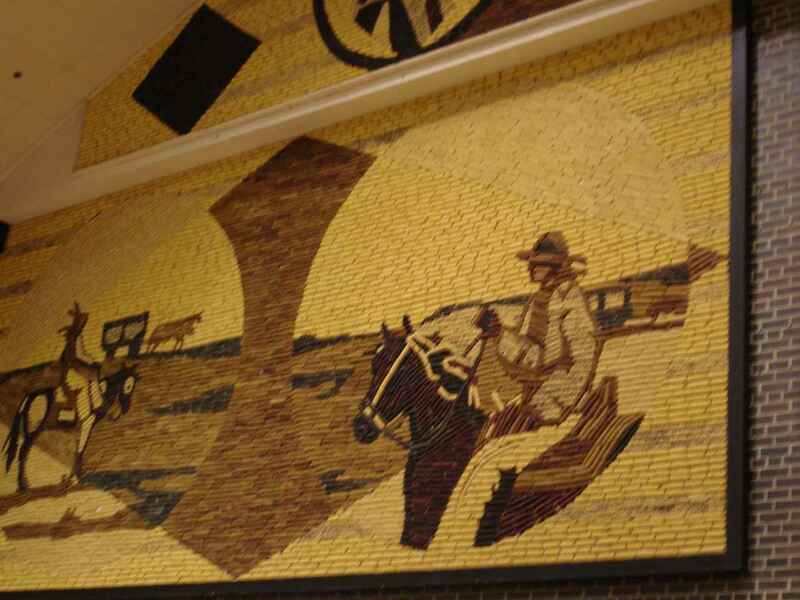 The murals change each year. A big celebration is held in the late summer and thousands come to Mitchell to celebrate ---with some big name performers as attractions as well. Some parts of the murals are created with fibers from the corn or grasses. The murals are created as corn by the numbers. Just like painting by the numbers. 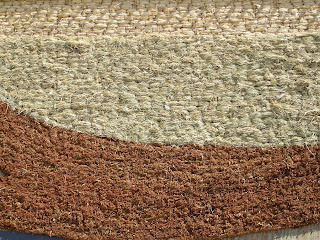 You can see some of the textures here. The subjects vary widely from year to year. 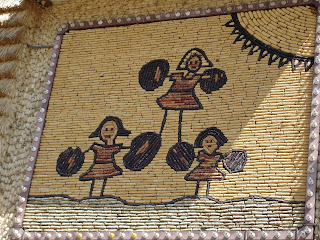 Inside there are many exhibits about , you guessed it---corn. We found it very interesting. Never knew so many products were made from corn. Some products we were aware of. 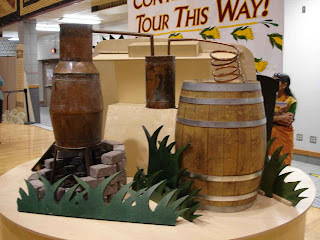 The still was just one of many displays. 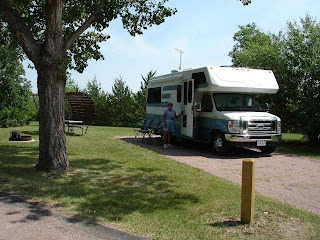 Last night , July 3rd, we chanced upon a last site on the Missouri river. 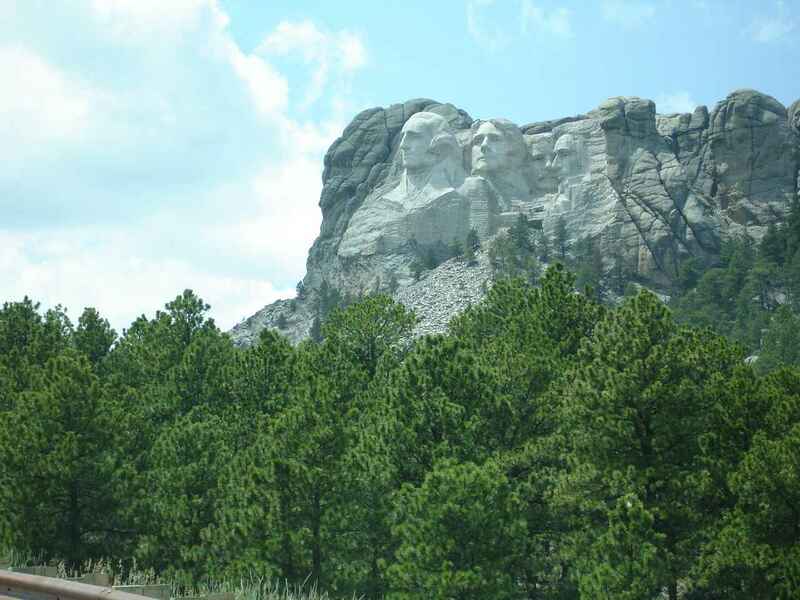 The manager was so nice and took us out in her golf cart to find us a parking spot next to the public park that overlooked the Missouri. It was dry camping, but a beautiful view with some fireworks to boot. Today, the 4th, we chance again to the Vermillion State Recreation Area. WE chance upon the very last site--to the left. One night only, but quite nice!